If you've been following my blog for a while, you will be aware of my applying to uni process and how stressed it has made me feel. 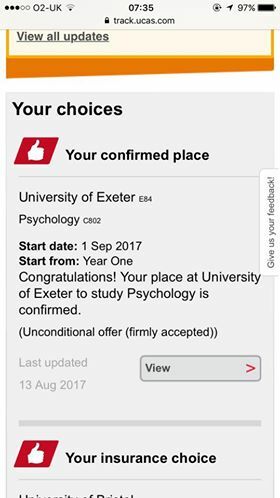 Well, on Thursday 17th of August at 7:30am I checked UCAS track and scrolled down to see that I had got into my first choice; the University of Exeter to study Psychology! Safe to say I've never moved so fast in my life as I ran(I actually ran, I never run) to tell my parents... I think Josh thought I was screaming because of a spider or something! After 2 years of not feeling comfortable at sixth form and just not really enjoying myself at all, I had succeeded! It was the best feeling because of the amount of people, mainly teachers, who told me that I couldn't do it but I had proved them all wrong. I had spent all summer worrying and only managed two hours sleep but this is the best thing that could have happened because if anyone knows me, they know I've had my heart set on Exeter for years now. So, I needed BBB to get into Exeter and even though I already had confirmation of my acceptance, I still believed I had only scraped my way in, maybe even got BBC instead. Therefore, when I arrived at sixth form and anxiously ripped open my results, I was beyond pleased when I saw A*AB(A* in sociology, A in English literature and B in psychology), I couldn't believe it! I really didn't believe my exams had gone well so to have achieved higher than my predicted grades was amazing and oh my goodness an A in English lit?! Earlier in the year my practice essays weren't getting high marks at all and I got a C at AS so I'm still in shock about this. It's safe to say that I'm really happy with how results day went and considering my circumstances, I couldn't really have asked for better grades. Well, it's all finally starting to feel real. I'm close to finishing buying everything that I need to take with me and if you're curious about what you think you should take, I have compiled a list which you can check out here! Yesterday, I received my accommodation offer and have started to talk to people who will be living in the same place as me which is really exciting, what's even better is that we are next door to one of the largest Spoons in the country! It's just strange that a couple of months ago when visiting Exeter for the offer holder day, this all seemed like an impossible concept and now it's actually happening! I also realised that I'm being awarded £1000 in my first year for achieving good grades which is going to help a lot and I'm planning on buying a desktop computer which I'm looking forward to as I've only ever had laptops and I've come to the conclusion that I'm not actually the biggest fan of them because as I'm quite accident prone and as I've broke a couple, I'm constantly in fear I'm going to snap them in half or drop them. I have a mixture of feelings about the whole thing. At the moment, my move in date is Saturday 16th of September which isn't far away at all and I think I'm quite nervous to move in as I struggle with all of the new social interactions but I also feel like I'm definitely ready to move on to this part of my life and hopefully make good friends and do things that I enjoy. I want this to be a successful part of my life and not something which I look back on and regret because I didn't do certain things as my anxiety stopped me. Saying that, I'm incredibly nervous for Freshers because I don't enjoy clubbing really so that won't be happening every night... I think I'm just overthinking it because I'm sure that there will be people who want to do other things too. I just hope that I actually make friends. What are your plans for the upcoming months?